Not to mistake with the Limfjord of the same name in Denmark!! 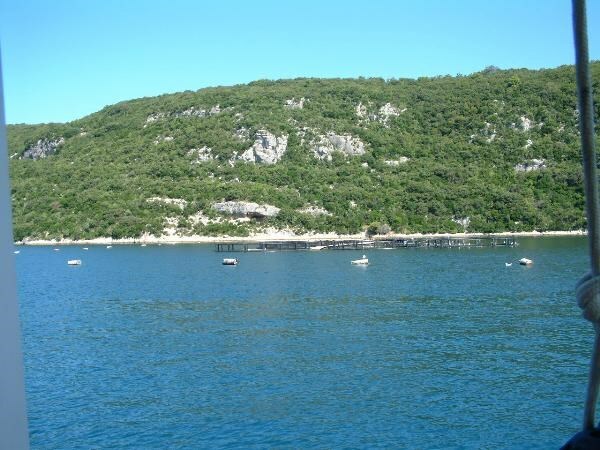 Here on the west coast conveniently between Vrsar and Rovinj it concerns not really a fjord which a glacier has dug in the rock, but around a Ria it has cleared away a river on his way over millions of years. Not only the approx. 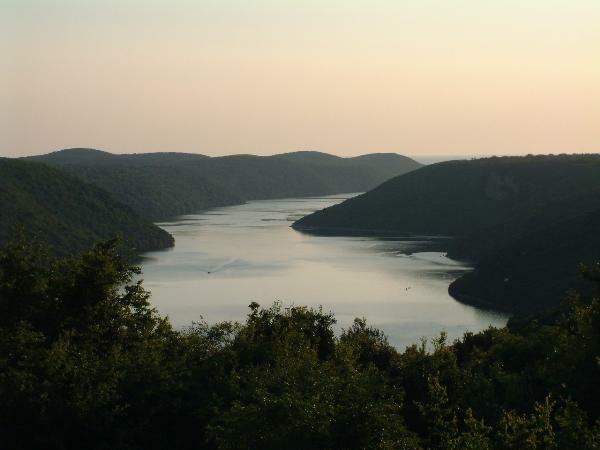 35 kilometres long Lim valley (Limska draga) but also this 10-km-long inlet has dug here, on her way in Adriatic the river "Pazincica". Ria is a type of coasts with a narrow and long, deeply penetrating into the land bay. In contrast to the fjord and promoting Ria was not formed by glaciers. Rias rather emerge from the river valleys that were covered by a flooding of continental areas with sea water, without that previously would have been from a glacier. They have therefore generally flatter than curves and lower depth coastal fjords. Fjords formed by valley glaciers, which flow from its origin, the Kar, through existing river valleys. The original is here form overprinting of the glacier by the ice sweeps rock and this further erodes the bedrock. The original valley becomes wider and deeper, and thereby obtains its typical U-shaped glaciated valley also called with very steep slopes. The reason may lie a fjord up to 1000 m below sea level. It is often found in the mouth of the fjord, a shoal, which is in connection with the flotation of the glacier tongue. With the retreat of the glaciers at the end of the Ice Age was the sea to flow into the deep valleys. Here in the Lim channel is the bedrock of karst rocks. The Karst (Karst of krš Slovenian and Croatian, which roughly means "stony and barren ground") The surface forms are well drained and out of water-soluble rocks (eg limestone, gypsum) are leached by surface and groundwater. By solving processes) there is characteristic karst phenomena on the surface (cart, sinkholes and geologic Uvalas organs). The underground karst features are often widely branching caves and underground rivers. From the bare karst is called when it is removed when a lack of both the topsoil and vegetation cover the bare rock is revealed. If a vegetation exists, it is called a covered karst. Unless there has greater than the karst rock weathering or deposition layer formed, the karst features visible only through Nachrutschen the surface. Originates from the lower salinity with the mixing with fresh water and the oxygen salary higher thereby in the water have settled here several fish and mussel farming. Already the bishop Eufrasius from Porec has recognised in the year 543 the fish wealth in these waters and has explained himself to the only proprietor. By the foundation of the republic Yugoslavia became of the Limski fjord again publicly accessible and in 1980 one explained the area to a special marine reserve while swimming is expressly forbidden. Howeverby the car about the E751 is accessible of the Limskikanal (Cache Limski fjord GC5ACE) but the best way to explore these up to 600-metre-wide fjord is the sea way. At the entrance to the fjord from the land side is "Romualds cave". 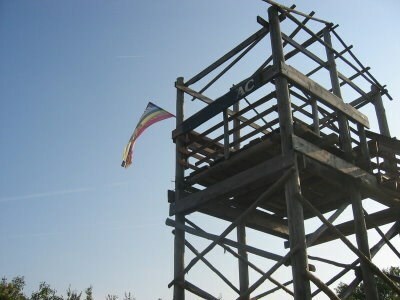 It is located 120 meters above sea level. The entrance is small in scale, so that a constant temperature is in the summer months at 12 ° C. The inside of the cave is dry, patchy water drops, this causing a drip shaped stone formations. 1. Take a picture of yourself with your GPS at the location and attach it to your log (optional/like this example). 4. tell me the differences between a ria and a fjord. Tell me via email your answers. Dont wait for my logpermission, if the answer or the picture are incorrect i will contact you!